Satsuki azalea (Azalea indica): growing, planting, caring. Full description for Azalea indica not yet available. If the indoor azalea is too delicate to withstand the cold outside, it fears the excessive heat of our apartments. On the contrary, the freshness is good for them! In the spring, flowering is at its peak when temperatures are around 16 ° C and during the winter you can place them in an unheated place (around 7 ° C). If you just got a new azalea, do not hesitate to repot it in the first year, early fall - by following our advice! 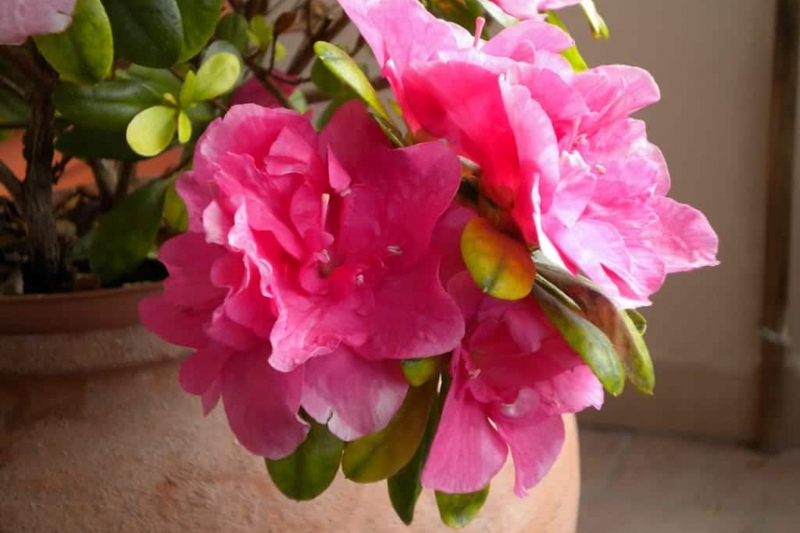 The next flowering will probably be later than the previous because, not forced, the azalea will resume its natural rhythm. Your azalea, if it is potted, will appreciate new legs every 3 to 4 years! Repot at the end of winter. Take the root ball out of the pot by hitting it against the edge. Set the root ball down on its side, then with a sharpened knife, cut the lower third of the root ball: the root system is fine and dense enough that it is easy to reduce the size. Next, remove a crown from the circumference. You will have reduced the root ball by about half. At the bottom of the pot, place a layer of gravel for draining, and repot the plant in a mixture of soil and ericaceous compost with a little bit of sand. Finally, tamp down and water generously. A few days later, you can carry out some light pruning by lightening up the center of the plant. For a beautiful bloom, bring a fertilizer for heathplants once a month, from spring to the end of the summer. Avoid conventional fertilizers because they contain minerals that can be toxic to it. Stop during the winter break. If there is a favorite mulching for the azalea, it is the barks and pine spines! They will preserve the acidity which it loves. Otherwise, mulch with compost or crushed bark! You can prune young plants to promote a well-branched form: the first two or three years, in April or May, pinch the tips of the new shoots over the buds. In any case, the bloom will be less beautiful than the first year - where it was forced a little in the greenhouse before arriving at home! To prolong the flowering, you can cut the faded flowers as they go, taking care not to touch the buds: they are the ones who will give the flowering next year! Take this opportunity to also remove dead wood, and when the bloom is over, trim the misplaced twigs. To multiply azaleas, you have to do cuttings! We suggest a cutting of semi-woody branches. What's this? It is these twigs, in August, which present a brown, hardwood part, and a new, green and soft wood. At this stage of development, the rooting of the stems taken will be better for the recovery of the cuttings! In August, therefore, after flowering, equip yourself with a disinfected and well sharpened pruning shears, a sharp knife or a graft if you have one, a mixture of heathsoil plus sand, some cutting hormone and pots. Prepare the pots, which must be clean. Add some gravel in the bottom to ensure good drainage. Fill them with mixture of heathersoil and river sand. Take semi-woody stem cuttings using pruning shears. Remove the flowers on the cutting and any knobs, cut the leaves at the base of the cuttings. Dip it into hormone powder, and shape a hole in each pot about 3 cm deep with a large pencil, for example. Insert the cutting taking care not to remove the powder, and reload by gently tamping the surface of the substrate. Sprinkle, moistening the mixture thoroughly. Cover the pot, for example with the lower half, cut out, of a plastic bottle. You should install the pots in the shade, ensuring that they never run out of water during all winter: you can transplant the next spring. As early as May place the azalea outside, in a rather shady corner, sheltered from the winds but where it will receive rain - it loves the cool nights of the outside and the rain, naturally a little acid. Leave this plant outdoors late in the fall, and do not shelter until frost is announced. In the wild, this plant spends the winter in almost freezing areas. When the frost finally threatens, you will notice some flower buds! Shelter it first in a cold room, not necessarily very bright - it will be much better, while near the radiator it will lose all its leaves! Azaleas are often prone to chlorosis, which is characterized by yellowing of the leaves due to limestone. The remedy is simple: increase the acidity of the soil! They can also be victims of attacks of red spiders, especially in hot and dry weather. Red spiders hate moisture: shower foliage at night in warm weather to get rid of it.